Glovius 2.1 for Android is here! Today, we are excited to unveil Glovius version 2.1 for Android. The latest update to our 3D viewer tool for Android brings support for Product Structure, Standard Views, Sample Models and improved performance. You can now view Product Structure for assembly models. The Product Structure is available in the app menu. For assembly models of supported file types, you will see the complete tree structure of the model. You can also toggle the visibility of sub-assemblies and parts using the check box against them from the dialog. Support for Standard Views is now available in version 2.1. To orient the model to a specific view, launch the Standard View dialog from the app menu and select any of the Front, Back, Left, Right, Top, Bottom and Isometric views. The model will orient to the view selected. A few sample models have been included in the app to get you started quickly with Glovius. To access the models, press the “My Files” icon on the app bar and select a model from the “On Device” list. To remove the sample files, press and hold the file name and select delete from the pop up. 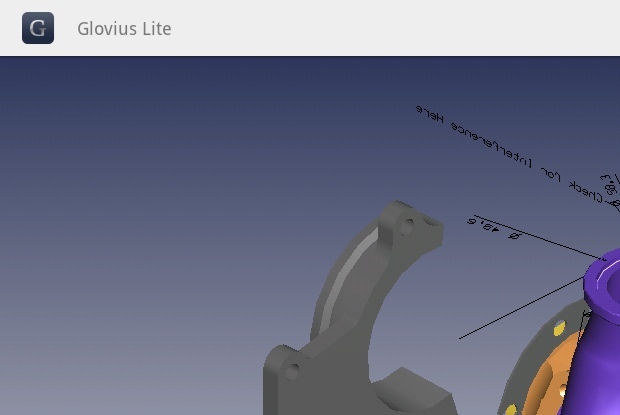 The free Glovius Lite Android app also gets an update with Sample Models and improved performance.